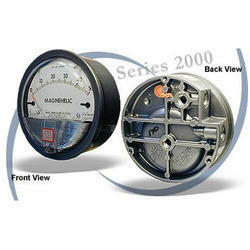 Pioneers in the industry, we offer magnehelic differential pressure gauges from India. Motivated to attain maximum patron approval, we provide patrons with the superior quality Pressure Gauge. Measurement accuracy, compact design and ability to withstand high pressure, make the pressure gauge highly demanded. Fabricated by using latest technology, the pressure gauge is used for pressure measuring in different industrial applications.